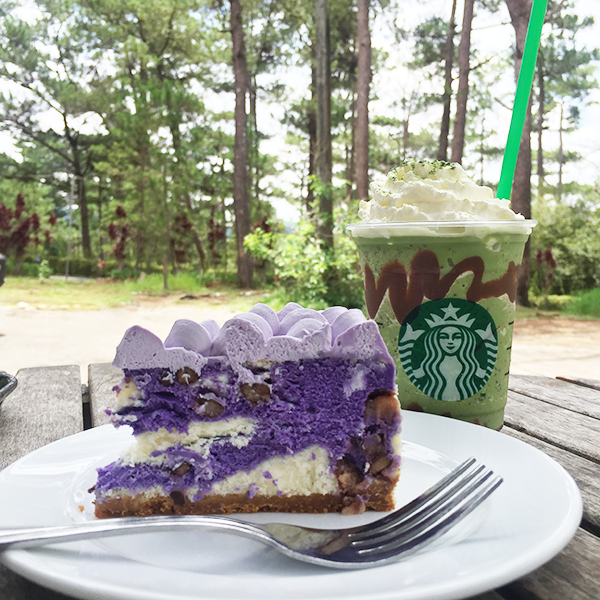 Tried out the Double Chocolate Green Tea Frappucino and my current dessert obsession - the Purple Yam Cheesecake on our last trip for the summer in Baguio. Just like our trip, these latest offerings from Starbucks are their last hurrah for summer and are available only until July 25, 2016. The Double Chocolate Green Tea Frappucino is infused with crunchy Java Chips layered with a smooth chocolate sauce at the top and bottom of the cup. It is topped with whipped cream and a light dusting of Green Tea powder. It's partner, the Chocolate Black Tea with Earl Grey Jelly Frappuccino, is blend of Kenyan Tea leaves and chocolate infused into a smooth and delicious Black Tea. It is finished with whipped cream and a sprinkle of chocolate Black Tea powder. Also available from June 7 - July 25 are the following: The Chicken Milk Bun, Chicken Parmigiana Wrap, Sausage and Spinach on Focaccia Bread, Breakfast Pancakes and the guilt-free Sweet Maui Onion Cassava Popped Chips that are gluten free, trans-fat free which weight watchers would definitely love as they contain only 100 calories per bag. Meanwhile, for those who would rather get their caffeine fix at home, you may try the new Starbucks Reserve Cape Verde and Starbucks Reserve Colombia San Fermin which are exclusively available in Starbucks Reserve stores. These blends are specially roasted to accentuate their full flavored taste when chilled.